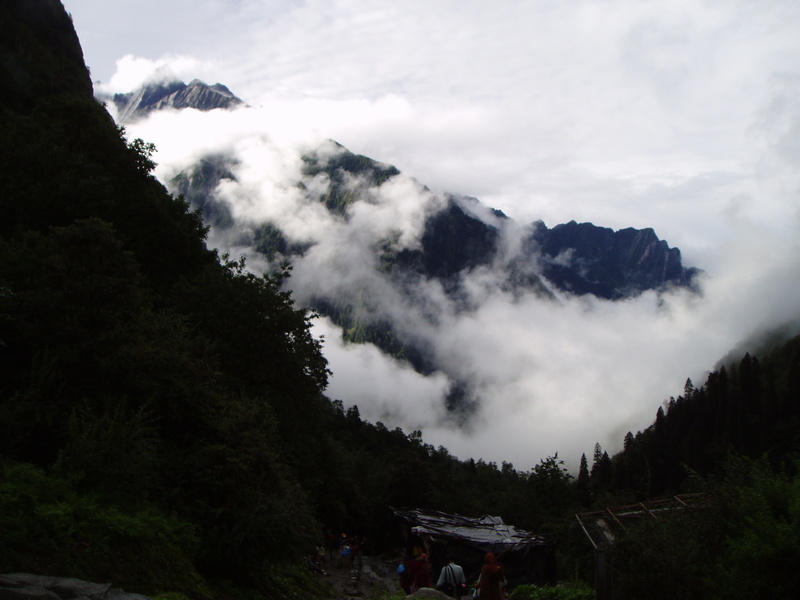 This is the third part of the trek to the Valley of flowers, read the first and second part for sequence or just dive in. There were deliberations and discussions and we decided to start real early on the fifth day. See once you are on the roads the real early bug needs to bite. And thank god for it. So we got all ready and a brief chai later we were climbing down. The five Kadambi clan cousins all decided to mule it downwards. So with the kids in the baskets and tea us, at about 7:00 ish the rest of us tumbled down. Soon we were joined by the ever racing Lakshman Ganga. Decently open skies, fresh morning and clean clothes on us made us sing. Lack of mules made it nice. 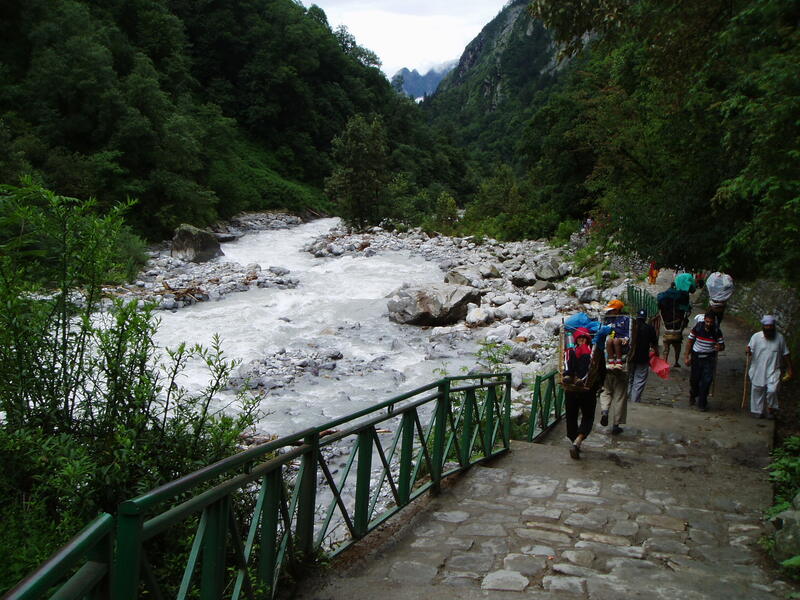 You see the resident mules of Gangharia only go up to Hemkund. So to ferry people or things down, the Govind-ghat mules need to come up first. These mountains have such simple rules. Nice. The rains decided to hold for the movement so we were walking without the raincoats. 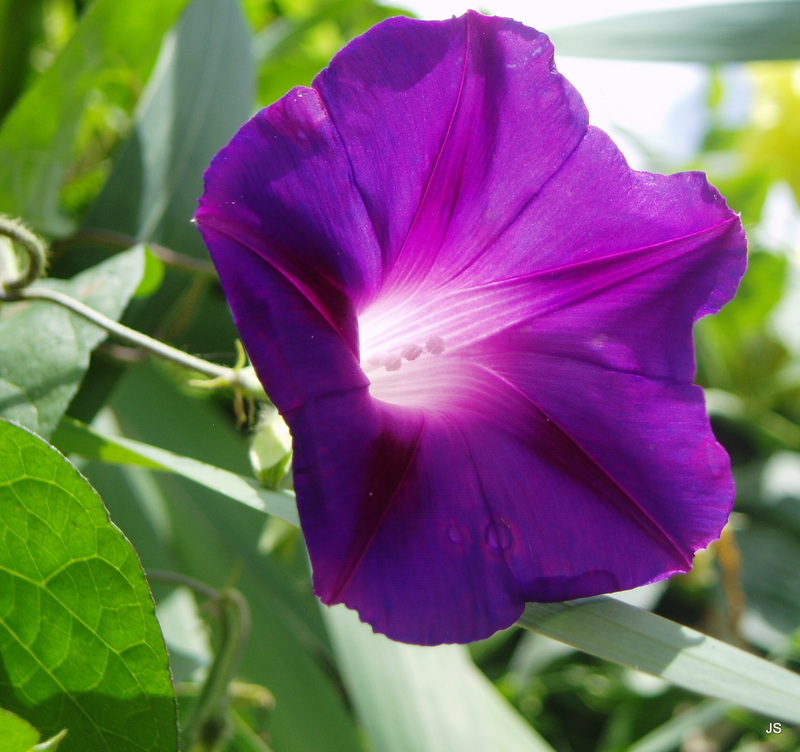 The path was clean, with few fallen flowers here and no dung. Yesterdays produce was cleaned by the helpful souls who keep sweeping the path as a service and today is a new day. We bought a photo album with the photos of the flowers. There is an Eco Development Committee (EDC) information center that has good books and CD about the valley. It was not open real early so the albums were made to do. Keshu had got the guide to buy them for himself though. As we walked and started telling tales of youth in energetic voice, lack of breakfast was raising doughts. Ignored. Moved on. The fifth day brought out the experts in us. I told the tales of mighty treks in the western ghats and then about the cycling trips in Varanasi were told. 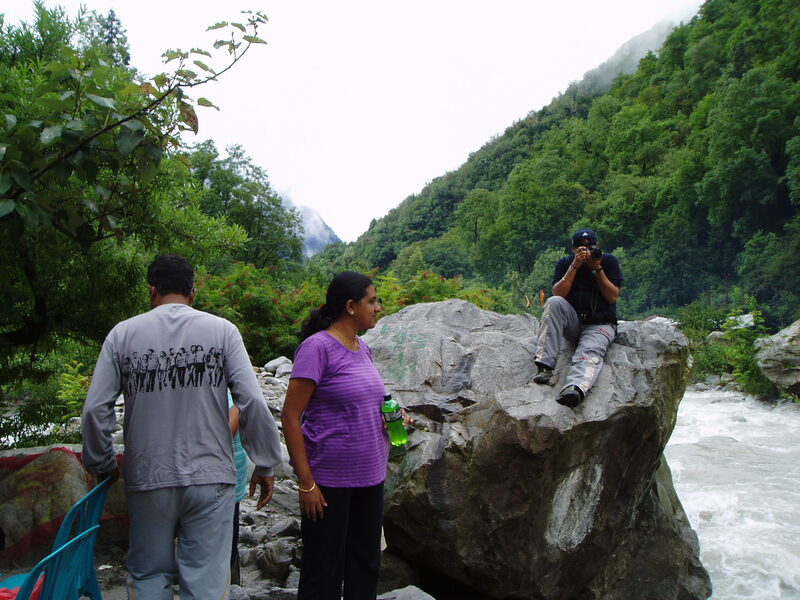 Krupa and Jayanthi talked of the Tapovan trip that they had made couple of years back. It is etched in the their memories and now in ours too. Prasad went on to capture the effervesce of unbridled water in his digital SLR. I was more understanding with the motion enabled handi-cam, how I wish I has taken more stills. I went ahead with the “kids’ basket”. Once we were sufficiently in front we called a halt near an eating joint and looked around, by now the dought was gathering support and getting more assertive. The Pittho folks recommended the “riverside restaurant” for breakfast. We wanted to cover more ground before stopping. I took few steps and looked. The Dhaba with its tandoor fire stoked up was looking good. Even better was the view. The river by the side of this riverside had created an island. The gushing streams on both the sides were white. There were two tables, few chairs and lot of room roam in that island and a wooden bridge to reach it. That view sealed the deal. We called the camp halt for food. As we settled and posed we ordered the national food of Indian bachelors, veg. Maggi and the other national food here abouts, Tandoori aloo paratha with butter and ghee. The troop trickled in and were exploring the little island. It gave us all a nice photo-op. I was trying to see if I can manage a flat stone to frog hop on fast flowing water. Wify dear was filming my flimsy efforts. Looking at the playback I realized in spite of all the treks, I am over weight. The rarified air, clear water focused the mind. Breathing became deep and a resolve formed. I will get my BMI under control. More exercise less food. The magical mountains helped in concentration and with even slower breaths the resolve dug deep, eyes closed by themselves. Breath in, breath out. Slow, even, strong. With each breath the resolve dug a bit more deep. Then an alien aroma started interfering with the process. The Aloo paratha was done and delivered and the down mountain wind carried the message. I heard the resolve crack and crumble over the din of the two branches of the roaring river. The Paratha was perfect, rough surface outside as something done well in the tandoor. The slippery butter evening it out. The starchy, spicy stuffing with right mix of salt and heat. Very very good. And then the vegetable maggie arrived. Nice steamy, with carrots, peas and tomatoes. I had few spoons. The best Maggie I had till date. Rest of the group agreed. As we were eating a cool group of Sardarjis came over with a music box. They were all over the rocks posing and dancing with energy. I tool their video and Prasad did his bit. We chatted and parted. We rounded off the island visit with some tea and back to the trek. The Pithoo gang broke for lunch few hours later. We decided to skip and take pictures of ourselves and few flowers instead. 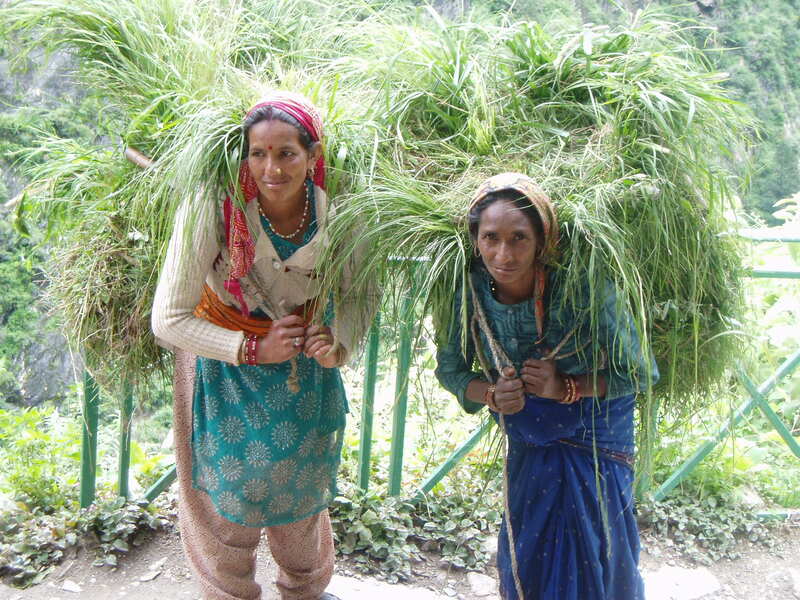 As we were climbing down we saw two local women climbing up with a load of grass in baskets. Walking and beaming. It felt they belonged to the mountains. I felt like an out sider. I smiled and they replied back. I asked them if I could take their picture. They posed.I clicked. Others joined and we had a group session. Once all was done, there was an air of expectancy in their eyes. I gave them money, the older one looked at the note and asked “Yeh chalega kya, doosra do na” ( This note is in bad shape, will it buy things ? Can I have another one ?) and then bit her tongue. We all smiled, nodded and made our way. So the tourist has corrupted the native. Life has to move on. We did too.Thus we reached Govind ghat. Bye Bye Valley. Will never forget you. Into the Tempo traveler for Auli the ski resort place. The Driver and the organizer were coaxed to change of plans. They made us pay extra. Few calls to the resort and we were climbing. We passed many apple tree and orchards. So many of them on the trees, by the road side. Our guide got down en route. He lives there. I was thinking of shifting my base there. 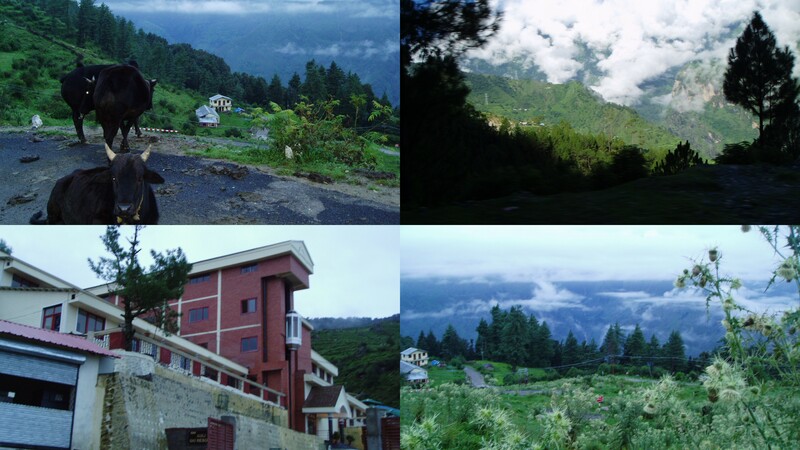 Auli is on top of a mountain and overlooking a range of them. It was raining, cloudy. The GMVN ski resort is luxury at this height. Nice clean rooms. White sheets, AC, How water, TV. Wide corridors, games room. The manager sweetened the deal by giving us an upgrade to the rooms and giving one room as a discount. Kids were merrily playing all over. I was missing the basic-ness of the mountain abodes so went out for walk. The road was deserted. Views spectacular. Rain had stopped and clouds were clearing. Small hut in the distance look as if in a post card. In the distance could hear the cow bells clinking, going home after day’s grazing. Dinner was interesting. You order in the evening. The cook telephones for the stuff to be brought up and then cooks. We ordered apple fry, kiddingly. The cook made it tasty. Few drinks followed by nice phulkas and then rice. Done. Sleep. Tomorrow it will be lazy day and a visit to Joshi math, that will be for the next post. Like sunshine to dissipate the grey clouds of monotony in our dull lives! Jaggu … you have to publish … beyond the web. Nice to see you are out of hibernation Deepanjan. Life is nice ?